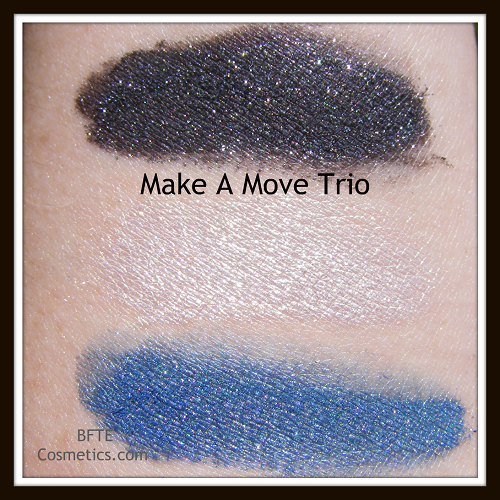 Make Your Move trio brings together basic colors but, with their own twist. Mix a pinch of each, swirl it together and you'll get a shiny silver shade. Now you have made your own twist! This collection is for 3 sample jars that hold .3 grams each. A shimmery white that has shifts of green and slight blue. Contains - Mica, Titanium Dioxide, & Tin Oxide. 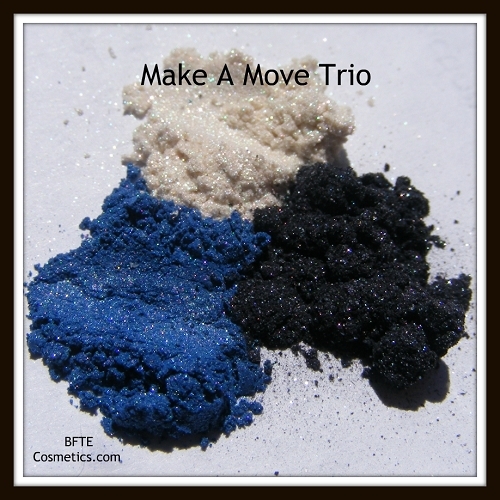 A vibrant blue with a silvery shimmer, a blue sheen and a slight shift of green. Deep and very dark gray with silver sparkles. Lots of rainbow micro-sparkles added in for fun. Contains- Mica, Titanium Dioxide, Iron Oxide, Tin Oxide, and Boron Nitride. All shadows can be purchased separately in full-size and sample jars.